Every week of the Trump administration delivers up a bountiful harvest of both pearls and onions. This week was no exception, presenting ample evidence of the schizoid nature of American political thought. Two interviews in particular, by their very contrast, illuminate the great divide in public opinion. In a run-up to a “Unite The Right” rally this weekend in the nation’s capitol, Chris Cuomo had comedian D.L. Hughley in the CNN studio. Hughley shot down the Nativism-apologist babble with this crisp no-brainer, “White men don’t get to define racism.” The lucky Americans who are dealt a winning hand, by virtue of gender and skin color, simply don’t have the frame of reference to grasp the nuances. Their dominance reflex may predispose them to assume they know it all, but it’s wasted breath to argue whether or not our president is a racist. “If it walks like a duck, talks like a duck…” The evidence has been clear since before the election. In diametric opposition to Hughley, this week we also saw Kanye West. A member of the Kardashian clan and supporter of the notion that Trump is the best president for Blacks, West was a guest on the Jimmy Kimmel show. Kimmel asked him directly, “What do you think Trump has done for Black people?” West’s answer was…..dead silence, followed by a vacuous grin. He could not offer a single example, so the show went immediately to break. The Trump detractor could articulate the problems, but the Trump supporter couldn’t name the benefits. The temptation is to conclude that allegiance is deaf, dumb, and blind. Most liberals can’t understand why ANYONE would support our president. For a person of color to favor this administration sails right past the column entitled “Inexplicable Behavior” to land with a resounding thud in the “Shoot Yourself In The Foot” category. This week’s pearl award goes to the sentient D.L. 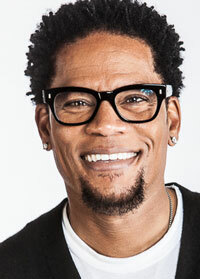 Hughley, hands down. Hopefully Kanye West likes onions—but if he does, he may not have the slightest idea why.